We haven't really gone public on the current TR Drivers Club project for rectifying the situation caused by British Motor Heritage (BMH should not be confused with BMIHT - they are separate, unrelated companies and have been for over 20 years). 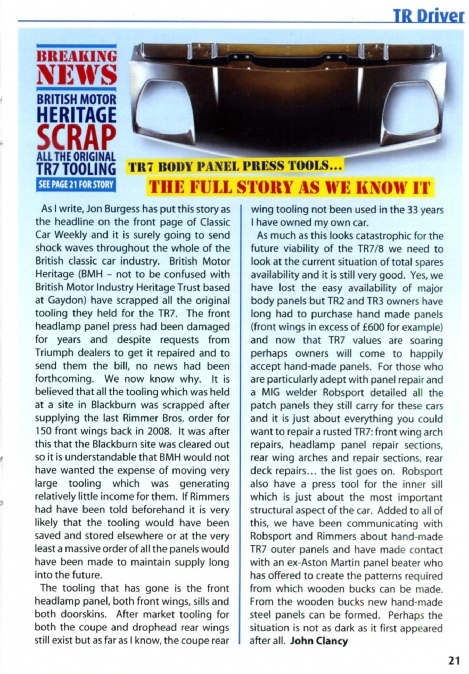 I was given clandestine information much earlier this year that the all the TR7 tooling they held had been scrapped but it was only when Classic Car Weekly contacted me that I felt the club needed to get all this information confirmed and that is what led to the headline on that weekly classic car paper. At no time did I contact the TR Register (although I did tell them a big TR7 story was about to break) or any other club and this was kept in strictest confidence. As a club we had already made enquiries with regards to panel reproduction and it was obviously the time to take those tentative enquiries further. The upshot is that the TR Drivers Club, with Brian Ridley-Jones as the main driver of this, have been re-importing original Leyland panels to use as patterns for new replacement TR7 body panel manufacture. We are sourcing the earliest original, never been on a car, panels to act as the patterns because these will provide the best fitting new panels possible as the end result. The BMH items were not exactly the best fit ever seen on a TR7 so hopefully this problem will be rectified in the future. The first panel we are looking at is the front panel, more often known as the headlamp panel or nose panel. This is probably the most major undertaking of the lot as it's a large, double-skinned panel. If we can get that one right then there will be no stopping us from there. The second we are currently looking at is the rear panel which houses the light clusters and goes in between the rear wings, the boot and the bumper. This panel hasn't been available for as long as I can remember. We have obtained new, original, early master panels of both the headlamp and the rear panel. It will be important to bear in mind that these replacement panels are going to cost significantly more than we have been used to paying up to now but that the TR Drivers Club are looking to mitigate the final cost as much as possible. They will of course be cheaper to club members but at least they will be generally available to all. The link to the relevant page from the recent issue of TR Driver is below but more information is coming in the next issue. If anyone wants to get involved in this project by contributing to the tooling fund please get in touch with me. This is a very ambitious and exciting project but it is happening. We have already found our preferred firm to reproduce the panels and we are looking to go down that route asap. We are doing this with the full knowledge and support of both Rimmers and Robsport. It should be noted that both these Triumph dealers have had TR7 panels remanufactured and have a wealth of availability of these panels. We do not want to duplicate anything they have already made available and have on the shelf already. Rich_K asked me in his front wing thread of the TR7 section of this forum what had gone at BMH to justify them scrapping the press tools along with a few other questions too. Whilst I don't have a definite answer to what went on at BMH (and they're not talking to anyone about it) from what I can ascertain, they scrapped the TR7 press tools when they cleared out their old Blackburn site around ten years ago. There wasn't much demand for TR7 panels so in that respect it was an understandable business decision, albeit a controversial one given the history of how they came to have the press tools in the first place. To not tell anyone is not understandable as something would have been done to save them. Having said that, because the panels coming off those press tools (front wings is what I'm referring to here) were not a particularly good fit, this could actually end up being not such a bad thing after all as we are going to have new panels manufactured from much better patterns. Quite a few TRDC members have banded together to get this project off the ground and have stuck £50 each in the pot. If anyone else wants to volunteer a contribution then please let me know and I will point you in the right direction. The final products will probably not be cheap but we are mainly looking to mitigate that as much as possible by funding them up to the point of fabrication i.e. funding the patterns and tooling. Members will then get a discount on the subsequent panels from the Triumph dealers who sell them. I hope that answers everything Rich. If not, give me a prod. Thanks John for your really informative post. Really impressive how you guys are working on resolving the panel situation. I will be happy to contribute. Looking at my spare panels I probably won't need any body panels in the near future! Accident damage is what will require the new panels Beans. Plenty of us have panels stored away but it only takes one little mishap and then a spare may no longer be available. These cars are in general not the rusting heaps they once had a reputation for and Robsport have the patch panels available for just about every area where rust can be a problem, so it's accident damage we need to mitigate against. But we will all need to band together on this one from all over the world for it to be an affordable reality to get everything re-made. We're already progressing the headlamp panel but the plan is to go much further and get all the panels available... except perhaps the roof. We'll see how things go and if it is a success then even the roof can be done - I've already discussed it with our current preferred manufacturer. is this the forum equivalent of "like"? Good to see the club being proactive,I would be happy to contribute if you could let me know how. I'd be happy to contribute. Good to hear that people want to help. I have also been offered NOS sills for patterns - somewhere amongst enthusiasts there will be every part we need I would imagine. John Clancy and I are meeting with a potential manufacturer at the NEC Classic Car Show next month and I will provide an update then. I would rather hold back on further contributions to the fund until there is something more positive to report, but now you have offered your help is appreciated! We will be updating TR Drivers Club members of the full progress shortly within TR Driver. As I write we are still awaiting the price for the complete front panel but have a cost for outer skin only. Rear light cluster full panel price is in. Progress is ongoing. The Register's new 'Wedge Team' has caused some confusion which is understandable. This was simply a case of bad timing probably caused by surprise when we broke the story via Jon Burgess in Classic Car Weekly and the Register felt they needed to be seen to be doing something. This is not the team managing the re-introduction of TR7 panels: the team creating the panels are the officials running the TR Drivers Club. However, the new TR7 Registrar within the Register (Jim Pickard - a very nice chap) and I had a couple of productive conversations with regards to the future availability of spares and I suggested that if the TR Register are in a position to get other unavailable parts made for the TR7 then that would be wonderful but to ensure to check with suppliers first as many parts we sometimes consider to be NLA are in fact available or in the process of being remanufactured. For that reason Rimmers and Robsport are fully aware of the panel project ongoing with the TRDC and it is hoped that panels will also be available through them in the end, albeit probably more expensive. We will fully consider the dealers as we go through this process as they have been vital to the survival of Triumph sports cars over the years and we fully appreciate all that they have done. More news will be publised in the next issue of TR Driver in about two months time. All the above came in too late to get into the current issue. To keep everyone up to date, we do have a final per unit price on a full headlamp panel but it came in just a few days too late for the upcoming issue of the club magazine. I hope to have a meeting at the NEC Restoration Show next weekend whereupon we'll be in a better informed position on the best way to proceed. Also, we will need to hear back from Rimmers and Robsport with their thoughts on the current pricing. Exciting times for all TR7/8 owners. If this comes off then over the years we may well be able to get all major body panels remanufactured including those that have not been available for over 20 years.